Welcome back, Ashes players! Last Tuesday we had our first look at the Boy Among Wolves expansion deck, featuring Koji Wolfcub and the Indiglow Creeper; check it out here! 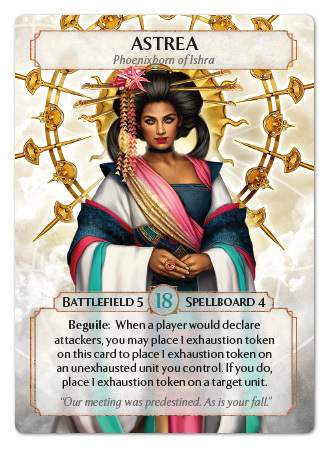 For today, we will begin exploring the Goddess of Ishra expansion deck. This deck features cards that use Divine and Charm magic to help you manipulate and captivate your foes in the midst of battle! No matter what forces your opponent brings to battle, the center of attention will always be the Phoenixborn of Ishra herself; Astrea. Astrea wields an incredibly potent ability in the form of Beguile. This ability can be used both offensively and defensively when either player would begin an attack action. Beguile can essentially allow for Astrea to set aside her weakest unit in exchange for her opponent’s most threatening attacker or strongest defender. In fact, if her opponent would foolishly try to attack with only a single unit, Beguile can put an end to the entire attack action! Alongside Astrea’s ability we have an average, but effective stat line of 5 Battlefield, 4 Spellboard, and 18 Life. With an ability unrestricted to any magic types and a well-rounded set of stats, Astrea is an all around great Phoenixborn that is sure to be the core of many powerful constructed decks. And if these features weren’t enough to convince you of the power of Astrea, take a look at her exclusive card, Mark of the Goddess! 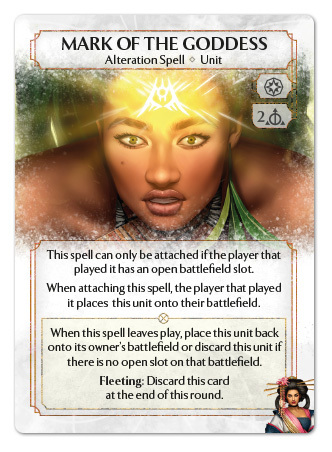 As the first ever Phoenixborn-exclusive Alteration Spell, Mark of the Goddess does not disappoint. This alteration can be placed onto an opponent’s unit, after which you will place it onto Astrea’s battlefield and gain control of it! Players cannot simply play down a huge threat like Hammer Knight on the first turn against Astrea without serious risk of betrayal! Mark of the Goddess does have the Fleeting ability, which means Astrea’s influence over her opponent’s units can only last until the end of the round, so be sure to send that unit into a battle it might not survive in, or follow up with a Blood Chains to further hinder your opponent’s battlefield. Later in the game, you may even have the opportunity to fill up your opponent’s battlefield with exhausted units and Blood Puppets so that the unit you stole with Mark of the Goddess will simply be discarded at the end of the round!